In June 2016, the UK voted in a referendum (by a small majority) in favour of the UK leaving the European Union. This is often called Brexit – short for “British exit”. However, the UK did not leave the European Union immediately. As you probably know, at this time (April 2019), the Brexit negotiations between the UK government and the European Union have ended, but the UK Parliament has not accepted the outcome. Before we know more, exiting the EU with a deal, without a deal or with a new deal are still all likely scenarios. This is why we ask you to read all the information below with caution. What does Brexit mean for EU citizens′ rights in the UK? Exiting the EU may have a major impact on EU citizens’ rights in the UK, who will no longer be protected by the freedom of movement that allowed them to settle in the UK. The UK government has announced a new immigration regime that in the event of Brexit will replace the old freedom of movement and will cover EU citizens’ rights in the future – this is called EU Settlement Scheme with a “Settled Status” application scheme. Under this new scheme, EU citizens who settle in the UK before a certain date will have very similar rights to what they currently have. When will changes to EU citizens′ rights enter into force? The UK leaves the EU on 22 May 2019, with a deal. If the British parliament finally accepts the deal, the EU citizens currently living in the UK will need to apply for the aforementioned Settled Status under the new EU Settlement Scheme. The rights of the EU citizens who arrive to the UK before end of December 2020 and apply for the new status will be very similar to what they currently have. You can read more about it on the UK government’s website or in our ‘Settled Status’ tab. The UK leaves the EU without a deal. In the event of No Deal, it is likely that EU citizens will still need to apply for Settled Status. The UK government released a Policy paper on citizens’ rights in the event of a no deal Brexit where it states that the UK will continue to run the EU Settlement Scheme for those resident in the UK by the exit day in a ‘No Deal’ scenario. However, the scheme will not be identical in the event of No Deal. Some changes will apply. For example, in case of No Deal, the UK government proposes that only EU citizens who arrive in the UK before the Exit Day will be able to apply for Settled Status. The rest will need to comply with The UK’s future skills-based immigration system. For more details on EU citizens’ rights in a No Deal scenario please consult the policy paper, as the proposals are similar to those guaranteed by the deal, but not identical. The UK postpones or cancels Brexit. We are not sure what will happen to the EU Settlement Scheme and Settled Status in this case. However, those EU citizens who successfully apply for a Settled Status are granted something called “Indefinite Leave to Remain in the UK”. This cannot be revoked (but in very special circumstances can be lost, e.g. if an individual leaves the UK for more than 2 years), and EU citizens who have ILR will retain it under any Brexit scenario. How likely is any of this to happen? It is important to remember that for now everything is only the UK government’s proposal. The implementation of any of the above depends on the political situation. I still have so many questions. Where can I turn for help? You can come to one of our events (we are working on new series; more information will be available soon). You can check our Citizens’ Rights tab. You can consult and download our printable Settled Status guide. You can read about Citizens’ Advice Scotland service for the EU citizens. From April 2019, Home Office will fund organisations across the UK to assist applications for Settled Status. The results are to be announced in the week beginning 8 April 2019. 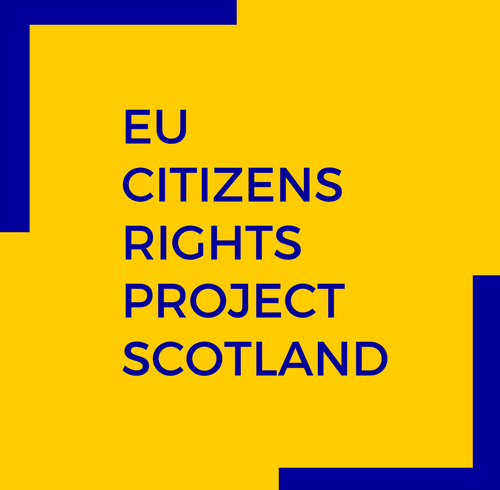 This website has been produced by the EU Citizens’ Rights Project Scotland, a company limited by guarantee in Scotland, company number SC561815, with financial assistance from the Scottish Government.